Typed GDScript is available since Godot 3.1. 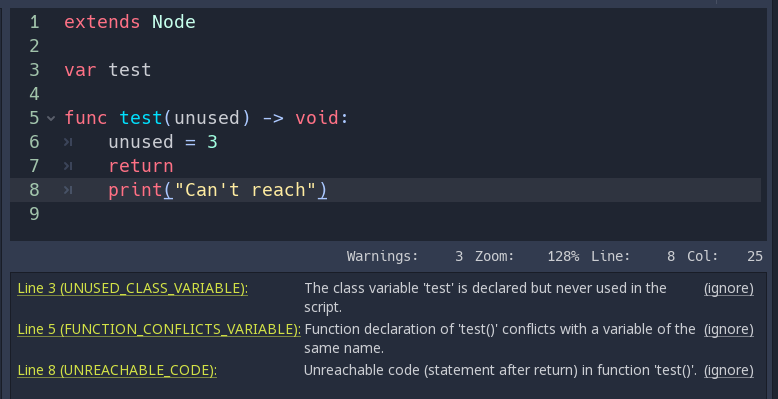 Static types also give you better code completion options. Below, you can see the difference between a dynamic and a static typed completion options for a class called PlayerController. In the future, typed GDScript will also increase code performance: Just-In-Time compilation and other compiler improvements are already on the roadmap! Overall, typed programming gives you a more structured experience. It helps prevent errors and improves the self-documenting aspect of your scripts. This is especially helpful when you’re working in a team or on a long-term project: studies have shown that developers spend most of their time reading other people’s code, or scripts they wrote in the past and forgot about. The clearer and the more structured the code, the faster it is to understand, the faster you can move forward. You don’t need to write type hints for constants, as Godot sets it automatically from the assigned value. But you can still do so to make the intent of your code clearer. Type casting is a key concept in typed languages. Casting is the conversion of a value from one type to another. You can also use casting to ensure safe lines. Safe lines are a new tool in Godot 3.1 to tell you when ambiguous lines of code are type-safe. As you can mix and match typed and dynamic code, at times, Godot doesn’t have enough information to know if an instruction will trigger an error or not at runtime. Typed GDScript is a powerful tool. Available as of version 3.1 of Godot, it helps you write more structured code, avoid common errors, and create scalable systems. In the future, static types will also bring you a nice performance boost thanks to upcoming compiler optimizations.